Puressentiel Lavender Aspic Bio is a magician who eliminates any trace of sting, burn, bite. It is absolutely essential in any family pharmacy, especially during summer holiday. Antitoxic, anti-infective and exceptionally healing, spike lavender, precious companion of the summer holidays, is indicated for "anything that bites": insects, jellyfish, sunburn. She exterminates lice and mites and remarkable fungicide overcomes mycoses (dermatological, including athlete's foot, digestive or gynecological) the most rebellious. 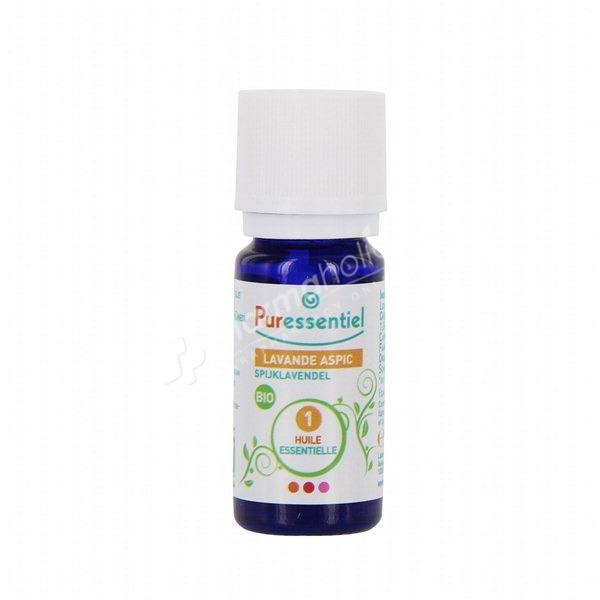 Rendering great services in ENT, it has an effective painkiller action, especially in cases of herpes zoster, herpes or joint or muscle pain (osteoarthritis, rheumatoid arthritis, cramps, etc.). Stings, bites, burns: 3-6 apply to the skin undiluted drops, 3-4 times a day to the affected area. If the burn, bite or sting just happened, repeat the application every 15 seconds for 2 minutes, then every 15 minutes for 2 hours (but in case of snake bite, this is not enough, see emergency physician). If the burned area is large (eg sunburn in the back), dilute lavender with as much vegetable oil wort: 5 drops of one, 5 drops of each other. Acne: Apply pure 2 drops each button on each black point, 2 to 4 times per day. Herpes: Apply two drops of each pure pustule at least eight times per day. Zona: Apply 2 drops of lavender mixed with 2 drops of vegetable oil calendula along the nerve pathway affected, 6 times a day until recovery (between 10 and 15 days). Other Uses:Spike lavender quiet good dental pain. Mix 2 drops of essential oil with 2 drops of vegetable oil and massage wort finger directly on the painful area and around the gums. Repeat as often and for as many times as necessary. Like all the essential oils, Lavender Aspic is prohibited during the first 3 months of pregnancy. It should not either be used in case of breast feeding. Do not use on children under 3.